Tea Importers, a Westport firm, recently received the Secretary of State's 2012 Award for Corporate Excellence for Sorwathe, its majority-owned tea farm in Rwanda. 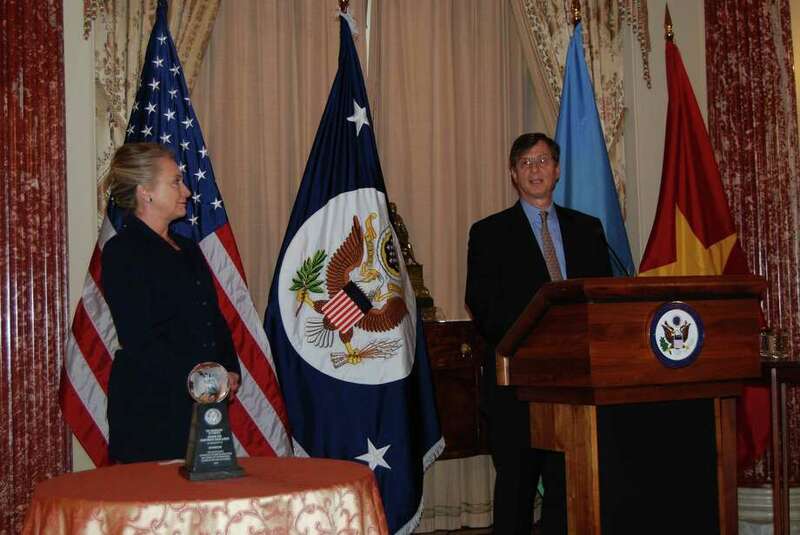 The award, given Nov. 28 in the State Department by U.S. Secretary of State Hillary Rodham Clinton, is an annual award recognizing U.S.-owned businesses that exhibit exemplary corporate citizenship, promote innovation and advance democratic principles around the world, according to a release. Sorwathe, in the northern town of Kinihira, is this year's small-medium-size company winner of the award for its efforts to support adult literacy, worker association and collective bargaining rights, sustainable agriculture, forestry and water management. It was also honored for its efforts to produce socially and environmentally responsible high-quality teas and leading the charge to eradicate child labor in Rwanda's tea sector, the release states. Representing Tea Importers at the ceremony were Andrew Wertheim, the firm's president; Jan Shackett, vice president; and Cally Alles, Sorwathe's recently retired general manager. Tea Importers, founded in 1958 by Joseph Wertheim, Andrew Wertheim's father, is a tea trading company serving customers worldwide, the release states. "I am extremely proud to accept this award on behalf of the employees of Sorwathe, Tea Importers, my family, and especially on behalf of 5,42 employees of Sowarthe and the 4,573 small farmers that we support through tea production in Rwanda," said Andrew Wertheim, a resident of New York City who grew up in Weston and Easton. Joseph Wertheim came to the United States to escape Nazi Germany and began importing tea in 1953 after settling in Connecticut, Clinton said. He began marketing tea from Rwanda in the 1960s, and its government eventually asked him to help build a factory for processing tea in a remote region of the country, she said. "Today, that joint venture, Sorwathe, is the top single producer of tea in Rwanda," she said. U.S. Sen. Richard Blumenthal and Congressman Jim Himes were among those in attendance.